Chaitali Chanda was born in 1976 in West Bengal. In 2004 she received her degree in B. V. A. in painting from Indian College Of Art and Draftsmanship, Rabindra Bharati University in West Bengal. In 2008 she exhibited solo at Somokal Art Gallery and participated in a two person exhibition at Academy of Fine Arts, Kolkata. In 2001, 2003 and 2008 she participated in the Annual Exhibitions of Academy of Fine Arts, Kolkata. 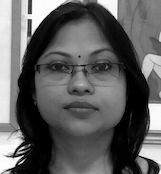 In 2001, 2006 and 2008 she participated in group shows at Academy of Fine Arts , Kolkata. In 2002, 2003, 2007 and 2008 she took part in the Annual Exhibitions of Birla Academy, Kolkata. In 2002 she took part in the State Annual Exhibition of IFAC’S, West Bengal. In 2002 she took part in a group exhibition at Lalit Kala Akademi, New Delhi. In 2004, 2005, 2008 and 2010 she showcased in group shows at Birla Academy, Kolkata. From 2004 - 2006 she had group exhibitions at Baurn Gallery, London. In 2006 she exhibited in a group exhibition at Jehangir Art Gallery, Mumbai. In 2008 and 2010 she participated in group shows at Open Palm Court Gallery, New Delhi. In 2008 she exhibited in a group show at Bajaj Art Gallery, Mumbai. In 2008 and 2010 she took part in a group show at Academy of Fine Arts Exposition, Kolkata. In 2016 she took part in a group show 'The Melting Pot' at Gallery 7, Kalaghoda, Mumbai. In 2001 she won the Certificate of Merit from Academy of Fine Arts. In 2003 she received the State Government Charu Kala Utsav award. Chaitali lives and works in Kolkata.